I'll make him a heart today, everyone should have one! Pattern updates: last night I was struggling with the Flying Monkey's face, I was just not liking any face I gave him so I stopped the frustration and made the Tin Man instead. So now I'm just a step ahead of the game, yay! I watched the movie again too, love it! Lovely tin man, as usual. Will you create a Dorothy after the robot ? And maybe the lion & the scarewrow ? This Tin Man is adorable. And yes, h e is in need of a heart. Great design. I love this story and film. I just recently found your site and can't get enough of your awesome designs!! Can't wait to see pattern for Tin Man!! As soon as I can I totally plan to donate. Can't thank you enough for sharing your talent!! I love it am anxiously awaiting the pattern for this one. All of your work is amazing !!! 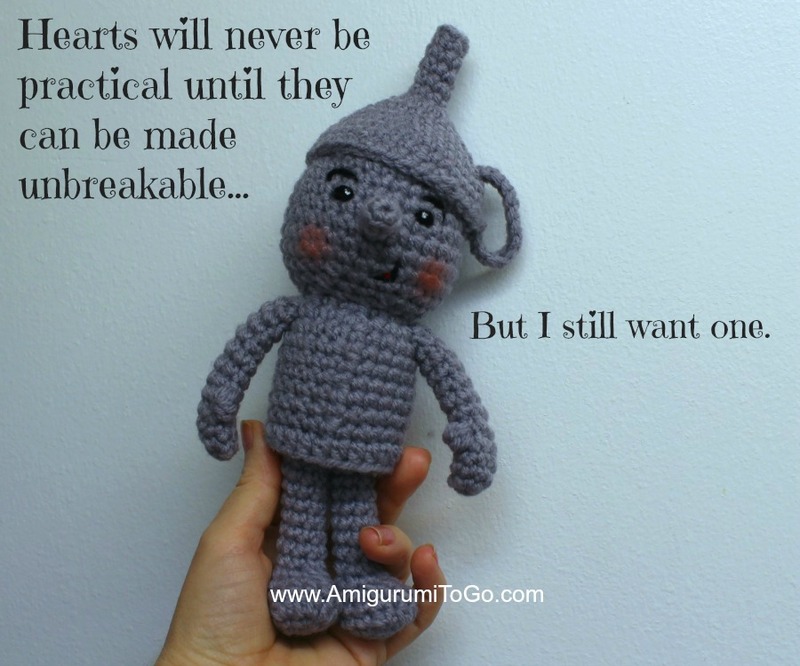 Did you ever post the pattern for the tin man? I can't find it in here. Yes, I did! I just updated this page with the link. I'm so glad you asked! I had forgotten to update here. In the future, so you don't have to wait for me to answer, there is a search bar. It's up near the top on the right hand side. Thank you, thank you, thank you. I'm so excited to make all of these. I do see that bar and I promise to use it if there is a next time. Your site is so easy to go through ( big thank You for that as well. )! I knew it had to be right in front of me, by the search bar. Lol. Thanks again.